In Texas, winter comes in week-long spurts followed by spring with dashes of summer. This patterns goes on from November through end of February. For the cold weeks, I love being wrapped in the savory scent of hot stew, accompanied by bread or biscuits. 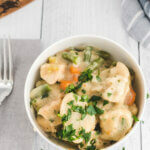 Chicken and dumplings is my personal favorite. A fellow dietitian sent this recipe to me as one of her winter staples that she recommends to her patients and feeds to her family. I whipped up a batch with a few modifications and can’t wait to share! Soup, for the renal diet, is always a challenge as it is traditionally a salty item. And, quite honestly, the salty-savory taste is often the hallmark and base of a great soup. A couple thoughts when you make a chicken-based stew. 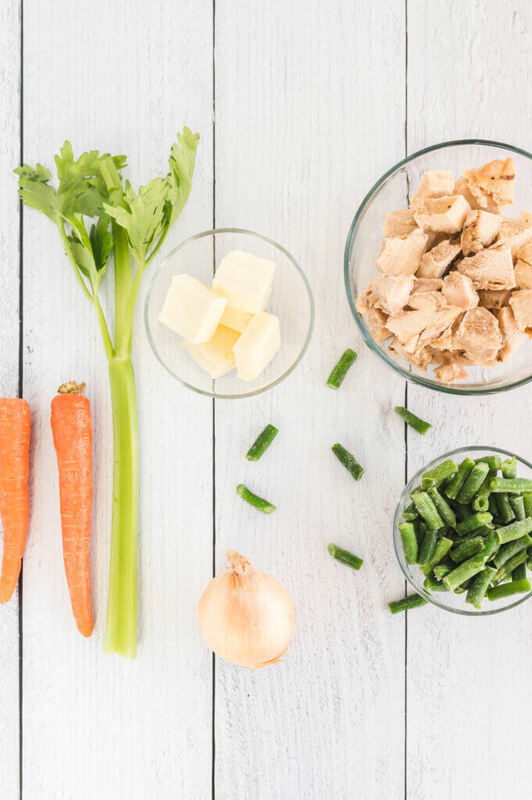 Most recipes will call for a chicken stock or chicken broth. To be clear, these are not the same and the variation in sodium AND potassium is enormous among the different products. I pulled what looked like a seemingly benign carton of chicken stock and was surprised to find it had 380mg of potassium per cup. Even with my experience, I couldn’t believe that some chicken stock/broth products had that much potassium! I’ve found Lipton no sodium chicken bouillon packets in my local Walmart before, but couldn’t find it recently, so I settled with the Great Value Organic Chicken broth, which had 140mg sodium/cup and 15 mg potassium/cup. Much better, right? 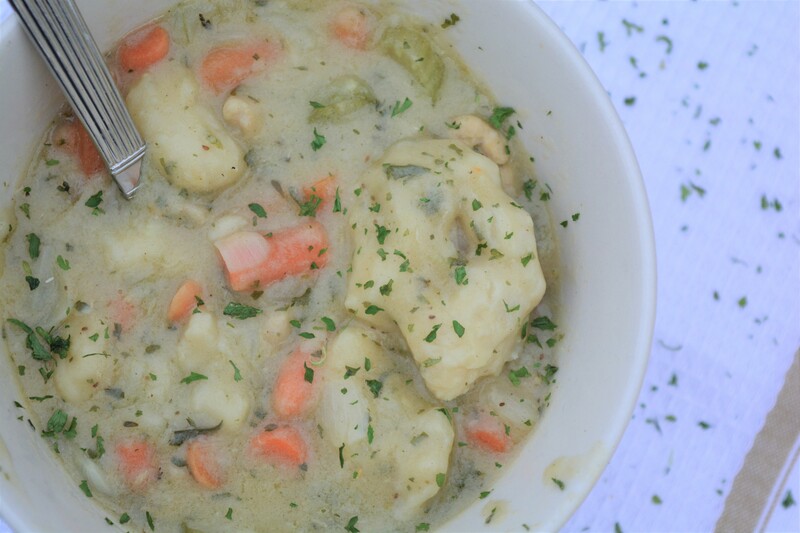 For a cold winter day, nothing beats a hot bowl of savory chicken and dumplings. In a large saucepan, melt 3 tablespoons butter over medium-high. Add onion, celery, and carrots and cook until onion is translucent, about 4 minutes. Add 1/4 cup flour and cook, stirring, 1 minute. Gradually add broth, stirring constantly, then bring to a boil. Reduce heat and simmer 5 minutes. Stir in chicken, green beans, spices and season with salt and pepper. Make dumplings: Whisk together 1 cup flour, baking powder, 1/2 tsp coarse salt (opt), and 2 tablespoons parsley. Cut in 2 tablespoons butter. Stir in almond milk. Drop heaping spoonfuls batter on top of chicken mixture. Cover and simmer until dumplings are cooked through, about 12 minutes. Serve topped with additional chopped parsley. *Look carefully at your label for your broth and stock. They vary widely in potassium and sodium content. * I added a 1/2 tsp salt after tasting it. This adds ~200 mg sodium/serving. You may not need this, and ideally you’d leave it out. However, in perspective 366 mg sodium for a cup of soup is very reasonable for a meal. I liked this. The original recipe is from the Martha Stewart collection. I liked that it was warm and only took one-pot (clean-up is not my favorite part of cooking). I added several savory herbs to the recipe to increase the flavor since we cut back on the salt from the original recipe. However, you’ll see in the notes, I added a touch of salt to the recipe per my tastes. I generally eat very low sodium, but I still felt like it needed a touch of salt to make the flavors pop. I fully recognize that not everyone has Ener-G Baking Powder Substitute on hand (though it is a worthwhile staple if you like to bake). The advantage of the Ener-G product is that it is low in sodium and phosphate free. High-five for cutting out those two buggers in one easy swap! However, you can still go phosphate free (though not as low in sodium) by using a combination of cream of tartar and baking soda to sub for the baking powder. The formula is always 1 teaspoon cream of tartar + 1/4 tsp baking soda per 1 teaspoon of baking powder. Last note, this was better the second day. The flavors intensified during the evening and made for a warm, inviting lunch the next day. Hi Grace – This is a big challenge! Making the nutrition work for people can be hard. I’d love to meet with you and sort things out. You can call my office to set up an appointment at 979.353.1126 OR I also just sent you an email. I think the renal diet is so confusing for many people. I highly recommend finding a renal dietitian in your area to be your coach and cheerleader. So much of the diet is not black and white guidelines, but finding the right portions. But to answer your above questions – any type of bacon, any type of sausage is all dependent on sodium content. You want to keep sodium to a minimum. I generally recommend for my clients to use these salty meats as a flavor in their meals not as the main part of meal. Aka, use crumbled bacon or crumbled sausage on top of a soup instead of as chunks in the soup. Brown rice is fine for people with kidney disease. It is slightly higher in phosphorus than white rice, but because of the fiber in the brown rice, much of that extra phos is not absorbed by the body. To find a renal dietitian you can check out NKF’s database here: National Kidney Foundation Renal Dietitian Database. Hope you received the email that I sent regarding this! It definitely can be so frustrating! A bit of warning: No-Salt bouillon substitutes Potassium for Sodium, which can be much worse for your kidneys! I find that the Swanson No-Salt-Added broth (chicken or beef) serves very well in recipes. Also, remember to count the sodium in the baking powder for your mineral limit goals. Same Potassium problem with no-salt baking powders, BTW, and the no-potassium sodium free ones are sky high in Phosphorus (worse still)! 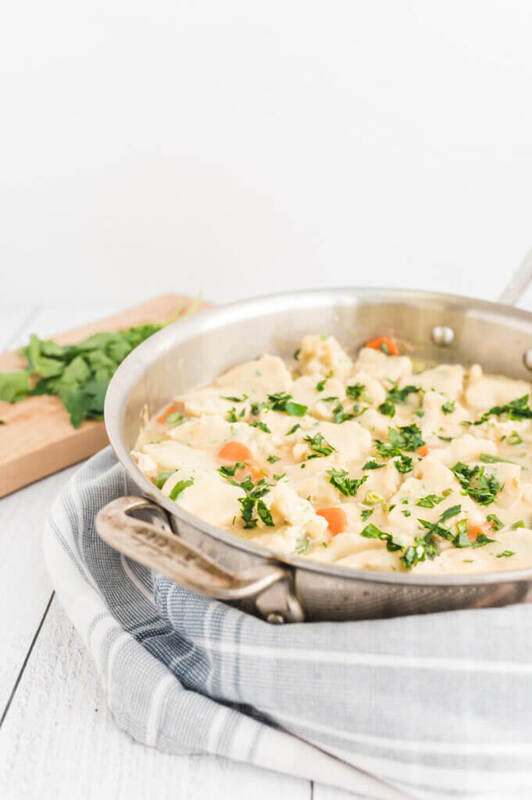 I intend to make a batch of this recipe with no-yolk eggwhite noodles (“dumplings”) and reduce the sodium, potassium, and phosphorus even more. Hi Charles – These are great points! I like to use the low sodium, phosphate free baking powder from Ener-G foods. I order from Amazon or other specialty grocers. Love your idea to use egg noodles for this!